Welcome!! On this website you can view over 12,000 designs of carved wood and HDU signs and plaques, one of the largest collection of carved signs & plaques anywhere in the world, for every style and application. These are carefully and methodically organized into 45 easy to search Product Line and Application photo Galleries, listed in the numbered gray boxes in the lower left margin. If you have just entered our website and you want an overview of our company and all our products, please start with our Home page (dark gray tab upper left). This page introduces our various products and provides a general overview of their characteristics and our ordering process. We offer various Product types which are roughly organized by sign type, material, and design features. You can see 200 examples of the most recent signs we have made on our Signs-of-the-Month page. That page gives an overview of the wide variety of styles and materials we offer for our dimensional signs & plaques; this page provides more details and specific examples. This page provides an overview of the various types and materials of the signs & plaques within each Product Line and their approximate prices. lick on the photos underlined Product Line titles below to go to that Product gallery page. Examples of these various products are also distributed throughout the Application photo gallery pages, as discussed in the paragraph below. We have also organized the photos in 36 Application Galleries (e.g. farm signs, lawyer signs, beach house signs,store signs, Federal plaques, military crest plaques, etc., in Galleries 10 through 35. An overview of these Application Galleries is provide on our Gallery Overview page. These photo Galleries are also listed by application in the numbered light gray boxes in the navigation bar in the lower left margin. Over 12,000 examples of sign designs are given in these well-organized Galleries. You can search for a specific type of sign type of sign, such as "Oak leaf address sign", or "sign with Skier on it" , or "red wooden stop sign", or "lawyer directory sign" or "B&B sign", or "sea horse beach sign", by entering these key words in the box in the top right header of this page with "Google" in it , and the search engine will give you links to examples of signs on this site, which you can click on to go to the referenced page. Prices. Our wood and HDU signs and plaques cost from 70% to 80% that of similar signs from most other companies.Our signs are primarily priced on per square foot basis (there are other factors as well, such as one vs two-sided, materials and design complexity). Wholesale prices are about 20% to 25% lower than retail prices (reseller permit required). Our smaller carved signs and plaques cost from $99 to $250, including custom hand-painted carved art and text. Sign size, type of sign construction, and prices are described on the Retail Prices and Design Features page. These are our most popular signs; inexpensive, simple, attractive, eye-catching, long-lasting with low maintenance. We offer a wide variety of sign shapes, sizes, font styles, and art icons for our completely custom three-dimension 2.5-D flat relief (i.e., multi-level relief, but each level is flat rather than curved as 3-D is) HDU signs and plaques. These signs are weather and moisture resistant, and will easily last at least 20 years with very little maintenance.. We will perform multi-level routing for the same price as single-level. Letters and art can be raised and/or engraved, with backgrounds smooth, sandstone texture, or simulated wood grain (the latter two by sandblasting). All our signs are first carved with our CNC roter, because it provides crisper, more accurate carving than sandblasting, and is much more versatile. They can have rounded edges, multiple borders, one or more art pieces , and multiple lines of text in the font styles of your choice, at the same low price. The price depends primarily on sign size , and is proportional to area (max width x max length). this, a 2 ft x 2 ft sign (area = 4 ft2) costs 4 times as much as a 1 ft x 1 ft sign (area = 1 ft2). Double side signs cost 50% more than single-sided signs.These carved High-Density-Urethane (HDU) are typically 1.5 inches to 2 inches thick.After carving the sign, the HDU is coated with a special HDU primer and dries for 24 hours before paint. After paint is applied, the entire sign or plaque is sprayed with 2 clear coats. These signs and plaques have premium 3-D bas-relief sculptured carved art and sometimes beveled or V-cut text , in contrast to regular sandblasted HDU signs which have 2.5-D art and text (flat but usually raised above the background or engraved into the background, sometimes referred to as flat relief). Our premium signs and plaques are suitable for residences, estates, businesses, and organizations where an dramatic and detailed sign will will attract attention while giving the impression of quality and elegance. The artwork is more elaborate and may depict a scene rather than a single object. The artwork will be first be CNC routed to give a bas-relief sculptured look, and for some signs, specific areas will be sandblasted. It may then be hand-carved (for some signs), hand-sanded, and hand-painted with artist brushes using oil enamels. We can also apply 24 K gold, aluminum or copper leaf to gild letters, borders or art., or we can antique some or all of the sign or plaque. We can also make V-cut or prismatic engraved letters or beveled or rounded raised letters. Text can be outlined and multiple borders added, which can be 3 D ( e.g., flourishes or rope pattern). We can work from a computer file, a photo, a sketch you supply, or we can create a new design for you. Also included in this category are cut-out letters of art appliques (usually made from HDU) mounted on a HDU substrate. These type of signs can range from the fairly simple to complex and elaborate. Art Sign Works makes beautiful classical and rustic carved engraved, 2.5-D, and 3-D carved wood signs and wall plaques.. Most of our wood signs and wall plaques are made from California Redwood or Western Red Cedar, but for our Wall Plaques and smaller signs we also use fine furniture-grade hardwoods such as Mahogany, Black Walnut, Red Oak, American Cherry, Maple and Teak. We offer the same shapes, sizes and artwork choices as for High Density Urethane (HDU) signs. Many people prefer the natural beauty of stained and varnished wood instead of the enameled paint finish of HDU, even though more maintenance is required for outdoor wood signs than HDU signs and their longevity is not as long and their maintenance us higher in an outdoor environment. We recommend our wood signs only if you want a natural or rustic finish or you sign or plaque will be protected from rain, snow, and the sun. If you want an all-painted sign, we recommend HDU instead. Of course, we can paint our wood signs as well as finish them naturally. We use only the finest grades of clear all-heart vertical-grain kiln dried Redwood and prime grade Western Red Cedar for our wood signs which we get from a specialty lumber supplier or direct from a sawmill in Idaho (for Cedar). These premium grades of wood has very few knots or defects. We also use reclaimed 100 yr old barn-wood when an antique or aged look is required. 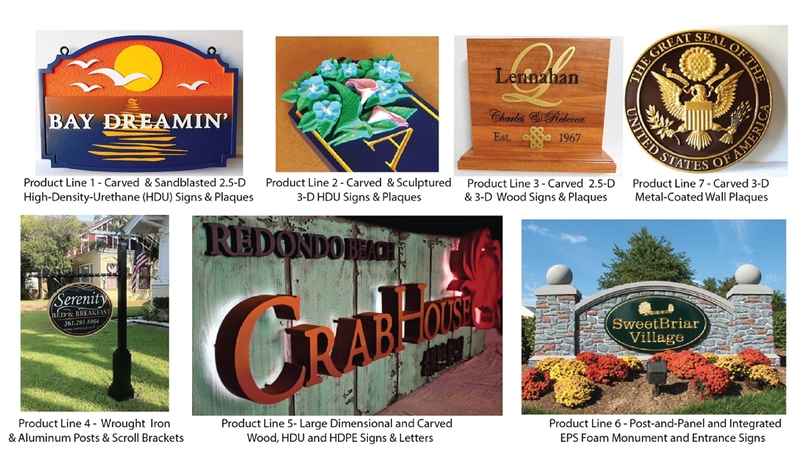 Wood signs can be simple sandblasted or routed signs, or can be elaborate 3-D carved signs (like Product Line 2, except made from wood instead of HDU). They can look very rustic or can be made of fine woods (e.g., mahogany, walnut or cherry) and finished like expensive furniture. We can make elaborate 3-D carvings as appliques or carved into the wood substrate, with stains and lacquer coats showing the natural beauty of the wood.We also make many "hybrid" wood / HDU signs, with carved and painted 3-D HDU mounted as an applique on a natural wood signboard. We also make aluminum, iron or wood sign holders, stands and frames for these signs. In this Product Line we offer unique and exquisite hand-crafted custom wrought iron and aluminum sign scroll brackets, hangers, posts and sign stands which interface with signs and plaques in our other Product Lines, for no-hassle sign installations. These can be custom-fitted to each of the sign shapes and sizes we offer, if you order the scroll bracket, post or stand at the same time as you do the sign. We offer a wide selection of top-quality standard wrought iron and aluminum hardware plus many custom wrought iron products we make in-house. These fixtures enable you to install your sign with minimum effort. All holes, chain lengths, etc. are already place correctly and adjusted to fit your sign's size, shape, and thickness. All of these products that are designed for outdoor use are either black powder coated or galvanized in a zinc bath, coated with a special corrosive-protection primer, and then painted with two coats of Rustoleum metal enamels in your choice of six colors(in-house products). All of these wrought iron products may be ordered with or without a sign. For more design choice details, please see our Sign Photo Gallery 4 . We design, build and install custom large redwood, cedar, Douglas Fir, aluminum, Color-Core HDPE, Aliminum, DIBOND , PVC and HDU signs on a custom basis . We have a complete integrated in-house capability for computer graphics design, vinyl mask and stencil cutting, sandblasting, precision sawing, power sanding, CNC routing, hand-carving and hand-sanding, gold leaf gilding, and airbrush and detailed artist brush painting. We specialize in all types of dimensional signs, with a variety of advanced design features such as carved and vinyl decal art and text appliques, sandblasted or routed incised (i.e., engraved ) letters and art, sandblasted backgrounds with and without grain patterns, bas-relief multi-layer sandblasted/hand-carved/or CNC routed and hand-painted Carved Art and high-relief HDU sculpture appliques which are hand-carved and hand-sanded. We paint our signs with the finest enamel paints (1-SHOT) or Matthews polyurethane acrylic (2 part automotive-type paint), or stains and varnishes (wood only). We can metal coat (bronze, brass, copper, stainless steel, or aluminum) all or part of a large sign. We can also gild applique or incised letters or art with 24 K gold, fine silver, or copper leaf. We can either provide the sign for you to install on your own support structure, or we can build the sign support structure ). We design and build support structures from Redwood, Cedar, Douglas Fir, steel, and aluminum.There are discounts for three or more identical or similar signs. (A) Post & Panel.These signs are supported by wood or wrought iron (steel posts), sometimes with lateral bottom or back beams. Posts typically vary from 4 inches in width (4 x 4's) to as much as 12 inches in width.The sign itself (the panel) is usually 2.5-D or 3-D sandblasted or carved HDU or wood, described in Product Line 5. Less expensive ones have 2-D aluminum, MDO or PVC-foam signs mounted on them. Wrought iron supports can have scrolls on them. We make both metal (wrought iron and aluminum) and metal-coated signs and plaques of various types (bronze, brass, copper, steel, iron, silver-nickel, aluminum, gold, silver) which cover a substrate manufactured from high-density-urethane (HDU), wood, plastic, or metal. Our bronze, brass and nickel-silver metal-coated plaques are most popular, and are alternatives to casr bronze or brass, or fully painted or stained wood plaques and signs. These wall plaques can have either raised and sculptured 3-D carved bas-relief art (similar to Product Line 2) , beveled or V-cut engraved text , or 2.5-D raised art and text, sometimes called flat relief (similar to Product Line 1) . All plaques and signs have a hard epoxy resin coating applied to the surface to provide a high degree of ruggedness and protection against damage, and to extend lifetime.These metal-coated signs and plaques, particularly the bronze and brass plaques, are suitable for both outside and inside use for memorials,dedications, monuments, government and public buildings, museums,historical buildings, informational displays, and great seals or logos on the walls of government buildings . Smaller versions are suitable for walls in lobbies, offices, conference rooms, and podiums.These metal-coated plaques are roughly 1/3 to 1/5 the cost of cast bronze or brass plaques, look very similar, and last 30 years or more. They cannot be walked on, however. Also included in this category are metal-coated cut-out letters of art appliques (usually made from HDU) mounted on a HDU substrate. We also make gold-, silver-, and copper- leaf gilded plaques and signs, and cut-out and/or sand-blasted solid wrought iron and aluminum signs .Solid aluminum and wrought iron cut-out plaques are generally least expensive, lower than Product LIne 1; metal-coated plaques have prices about 40% higher than Product Line 2, and fully covered gold-leaf and silver-leafed plaques are the most expensive. We often cover only a small fraction of the plaque with gold opr silver leaf (sich as V-carved text or a 3-D art applique); these have much lower prices. We request a deposit (50% of sign value) AFTER you approve the PROOF, at the time you place your order and we begin production, with the remainder due the day the sign has been shipped and/or installed. However, for established customers or government customers, we may requesting the final payment until you receive the signs. or shortly thereafter. We recommend you first visit the Product Galleries. . If you see a given type of sign or plaque you like, you may email us with your requirements, OR call us at (951) 698-8484 OR go to the Request an Estimate page, fill out the short form referencing the sign's ID number (e.g., M2315) and modifications you want made, and send it to us.You will be sent a quote and preliminary sign design within a couple days at no cost or obligation. You may also send us a photo or drawing of a design that you have, or refer to a design in the Product Galleries(specify the ID number please; in these situations there is no design fee. After you approve the design, you can place the order with a credit card and we will begin production on the sign.You should receive the sign 4-5 weeks (depending on our workload and shipping time) after an order is placed.